Tunkwa Provincial Park contains two large, man-made trout-fishing lakes, Tunkwa and Leighton, with campgrounds located on both lakes. Tunkwa is listed in the top 10 provincial rainbow trout fisheries. This park protects mid elevation grasslands, forests, lakes, and wetlands including bogs and ponds. This is a year-round recreation area, noted for camping, hunting, horseback riding, wildlife viewing, fishing, cross-country skiing, and snowmobiling. 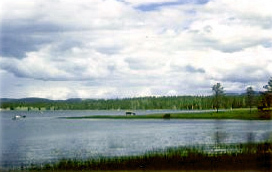 Tunkwa Lake has informal clusters of campsites. Facilities range from the typical individual campsites to clusters of four, allowing camping parties to camp together. Vehicle and ATV access is limited to designated trails as fish bearing streams wetlands and grasslands need special protection and should not be crossed. There is a staging area bordering the North Leighton campground that is set aside for ATV use. ATVs are prohibited within the campground boundaries. Two special management areas are foot access only. There are populations of Yellow-bellied Marmots residing in/around Tunkwa Provincial Park. They are a naturally-occurring species that reside in arid grasslands with abundant rock piles. The campgrounds in Tunkwa Provincial Park are located in mid-elevation grasslands which provide a favourable habitat for marmots in regards to climate and food sources. Natural talus slopes and large rock outcrops are rare in the park, but numerous man-made features mimic ideal marmot burrowing grounds. As a result, Tunkwa Provincial Park has a relatively high Yellow-bellied Marmot population. Visitors to the park are encouraged to protect their assets as marmots are curious and have been known to carry out activities that can be detrimental to vehicles, camping equipment, etc. The park is located midway between Savona and Logan Lake on the southern Thompson Plateau, about 40 km southwest of Kamloops. It is accessed via 24 km of paved road from Savona or 16 km from Logan Lake on the Tunkwa Lake Road. Cultural Heritage: The area has experienced traditional First Nation use. It also has a long history of ranching. Conservation: The park is a mosaic of grasslands and interior Douglas-fir forests. The park encompasses two large artificially created lakes – Tunkwa and Leighton – and numerous smaller lakes, wetlands and bog complexes. Many water-courses provide excellent opportunities to view spawning trout in May. Wildlife: Moose, mule deer, white-tailed deer and birds such as the Canada goose, mallard, common snipe, vesper sparrow and mountain bluebird all make their home here. Canoeing and kayaking opportunities exist on both lakes. Both lakes are popular for trout fishing. Lakes are stocked annually with rainbow trout. Fishing is from boats, float tubes, canoes and from shore. There are no fish cleaning stations. Fish must be cleaned out in the lake. Anyone fishing or angling in British Columbia must have an appropriate licence. Visitors can hike the grasslands or do a long wander around Tunkwa Lake. The Freshwater Fisheries Society of BC has a fun, hands on, Learn to Fish Program that will teach basic angling skills to youth under 16 years old. Check back to this page or ask the Park Operator for information. Pets must be on a leash at all times and are not allowed in beach areas or park buildings. You are responsible for their behaviour and must dispose of their excrement. There are two gravel boat launches, one at Tunkwa and one at Leighton. Tunkwa has a maximum 10 HP restriction, and boaters on both lakes should use slow speeds to avoid damaging habitat or quiet fishing enjoyment. Firewood can be purchased from the Park Operator or you may bring your own wood. Fees for firewood are set locally and may vary. To preserve vegetation and ground cover, it is prohibited to gather firewood from the area around your campsite or elsewhere in the park. Dead wood is an important habitat element for many plants and animals and it adds organic matter to the soil. You can conserve firewood and air quality by keeping your campfire small. If you rely on campfires for cooking, be prepared to bring a portable stove should a campfire ban be implemented. Hand pumps provide potable water. Two pumps are located at the Tunkwa Campground and one pump each at both Leighton and Leighton North Campgrounds. Larger groups of campers are accommodated in the cluster sites, fees are charged on the usual per-party basis. Day-use facilities are available at the south end of Tunkwa Lake. A pit toilet and 10 picnic tables are provided. This is a natural grass area right next to the lake that is very open with no shade. Pit toilets are located at each campground. At Tunkwa Park there are three separate campgrounds, Tunkwa, Leighton and Leighton North. Combined, the three campgrounds offer 55 traditional style sites and 220 informal sites. The traditional sites are typical of those found in BC Parks. They can accommodate camping units from a tent to a large recreational vehicle. The sites are in both treed and open grassy areas. The informal sites allow for groups of camping units to camp together. Some of these group sites are in treed areas, however some are out in the open with no trees or shade. All three campgrounds offer both styles of camping. If there are no staff at the campground upon arrival, choose a site and pay later. Staff will be at the campground at least once a day during the camping season. The entrance gates are not locked at night. The nearest pay phone is right where you enter Tunkwa campground and the nearest amenities are in Logan Lake. Sites 50 to 74 are designated as “long-stay” sites. A minimum of 4 consecutive weeks must be booked. The long stay program is from May 1 to October 12 in this park. Please contact the Park Operator to book one of these sites. Information on other parks participating in this pilot program, or a link to the Long Stay Policy document, is available on the Frontcountry Camping Policies and Fees page.